Believe it or not, online, customers generally do a lot of window shopping. There is one distinct difference between the online and traditional window shopping- that is customers have the tendency to toss more items into the virtual shopping cart and after that they abandon their shopping journey. As per the study conducted by Baymard Institute, ‘as of July, 2013 the average shopping cart abandonment rate is 67.45%.’ The number is incredibly hard to ignore. This kind of situation happens in brick and mortar store also, but in case of online shopping the rate of cart abandonment is remarkably higher. Every time when a customer abandons the cart and move away from the website without making a purchase, the business loses its profit. In case of online shopping, there can be several reasons behind this issue but the main will be customer pain points along with the path of conversion. Shopping cart abandonment signifies the loss of a buyer who was going through the checkout process in an online shopping portal to buy something. The customer may face several problems like doubt about the product he/she wishes to buy or about the payment process and many more. So in that case if anyone can help her out, then there is a huge chance that she will finally complete the transaction and buy that product. So the solution will be adding website live chat through which your agent can reach her proactively to offer instant assistance. ‘Hidden’ shipping charge is one of the biggest reasons of the increasing cart abandonment rate. The extra shipping charges are actually very difficult to find until in the cart, the final price is displayed. The higher shipping charges make shoppers so frustrated that they leave the website without buying anything. So what’s the solution? Always try to offer free shipping or very minimal charges and display it on every web page, including the ‘HOME’ page of your website. So let’s take the example of Zappos, which is a famous e commerce portal offering FREE SHIPPING and the most important thing is they have mentioned it on the ‘HOME’ page itself. So when customers come to this website, they clearly get the message that the shipping is free which eliminates any confusion at the checkout point. 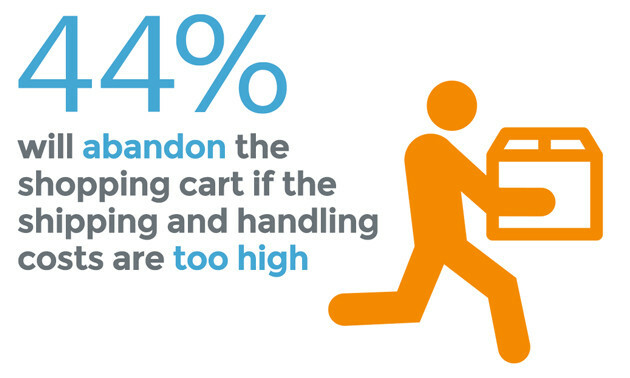 This is a great tactic to reduce the cart abandonment rate. Some shoppers who are trying to do the online transactions, suddenly start worrying that they have placed wrong items in their cart and want to have a second look. So there is a possibility that they may lose focus and eventually leave the website without buying anything. The simplest way to deal with this kind issues is to display images of their selected products in the shopping cart. So there will not be any confusion about what products they are buying. Frequent pop up ads, asking for additional info and other distractions only make your buyers irritated and as a result they leave your website. So go through all the checkout pages of your website very carefully to see if you are asking for too much info from your buyer. The fewer the distractions are, the better is the chance that people complete the purchase. Always allow your website visitor to buy items without becoming a member. Enable him/her to complete the purchase as a ‘guest’ which provides her a sense of anonymity that some buyers prefer. It’s important to get the sale first. After that the customer may return to your website again and register as a member. In other case, if you force her to register before completing the transaction, she may feel irritated and leave your website. Here let’s talk about Walmart. See the above image. 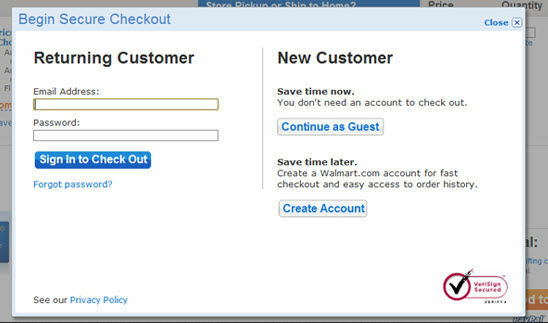 During the checkout process, Walmart gives 3 options: I) you can login with your existing Walmart account, II) can continue as a guest, and III) can register right now. So your customer does not feel pressurized knowing that he/she can proceed without registering. In case of payment options, offer as much convenience as possible to your customers. Don’t force them to use the options which you are offering just because you are unable to accept their preferred mode of payment options. In that case, you can opt for other third party online payment service providers which reinforces easy payment and enables your website visitors to complete online transactions. The below mentioned example shows Flipkart’s extensive list of payment options for their online store. Promo offers can be a very unique way to woo your online buyers. But it has some inherent problems- when a customer comes to the checkout page and finds a promo code box there, he or she often starts to search other webpages for all the available discounts. In that case, she can become side tracked or even find some better deals in your competitor’s website and finally abandon the shopping cart. So the solutions will be displaying all the discounts and promo codes in the checkout page. So, the above mentioned tips are not just for improving the conversion rates but also for providing better customer experience as well. If you apply these tips for your e commerce shopping portal, you will see the improvement for sure.